United Nations: United States Permanent Representative Nikki Haley has condemned as "highly offensive" and "disgusting" rumours spread about her personal life by opponents of President Donald Trump that highlight the ugly underside of American politics. The Indian-American member of Trump's cabinet told Politico that rumours of her having an affair with the President were "absolutely not true." The rumours illustrate a persistent problem of US politics where character assassination is used especially against women and minorities by the entire political spectrum -- and not just the Republicans. The former South Carolina Governor is an inviting target for attacks by Trump's opponents as she is both a woman and an Indian-American and has been the victim of such campaigns in the past. "Every time this has happened, it only makes me fight harder," she declared in the interview with Politico that was published on Friday. "And I do it for the sake of other women that are behind me because they should never think that they have to put their head down and cower out of fear that somebody's gonna do something to you." Politico, an influential media covering politics, reported that she said author Michael Wolf's "insinuation is similar to other attacks that she and other successful women have faced when they've been forced to swat down suggestions they've slept their way to the top." Politico attributed the online speculation about her and Trump to Wolf, who recently published "Fire and Fury", a book critical of Trump and claiming to give the inside story of the White House. Wolf "dropped hints on HBO's 'Real Time with Bill Maher' last week when he said he was "absolutely sure" Trump is having an affair -- "just not sure enough to write about it in his book," Politico said. "Wolff went on to say that discriminating readers would be able to determine the President's paramour by giving his book a close reading: 'Now that I've told you, when you hit that paragraph, you're gonna say, Bingo." Politico said: "Readers quickly homed in on a single sentence" in the book where Wolff writes "The president had been spending a notable amount of private time with Haley on Air Force One and was seen to be grooming her for a national political future." "I have literally been on Air Force One once and there were several people in the room when I was there," she told Politico, referring to a flight from Washington to Long Island in late July. "He (Wolf) says that I've been talking a lot with the President in the Oval (Office) about my political future. I've never talked once to the President about my future and I am never alone with him." Haley told Politico: "It goes to a bigger issue that we need to always be conscious of: At every point in my life, I've noticed that if you speak your mind and you're strong about it and you say what you believe, there is a small percentage of people that resent that and the way they deal with it is to try and throw arrows, lies or not." "I saw this as a legislator. I saw this when I was Governor. I see it now. I see them do it to other women," she added. When she ran for the office of Governor of South Carolina in 2010, two men, one of them linked to her political opponent, claimed to have had affairs with her. The voters in the conservative state roundly rejected the filthy campaign and elected her for two terms, making her the first woman and first non-white to become its Governor. Haley, who initially opposed Trump's bid for Republican Party nomination, supported him in the election after he became the party's candidate. She was reported to have been one of those considered by Trump for Secretary of State, but ultimately got the UN job, making her the first Indian-American to get a cabinet-level post. While critics homed in on her lack of international experience, at the UN she has been pushing Trump's hawkish agenda. 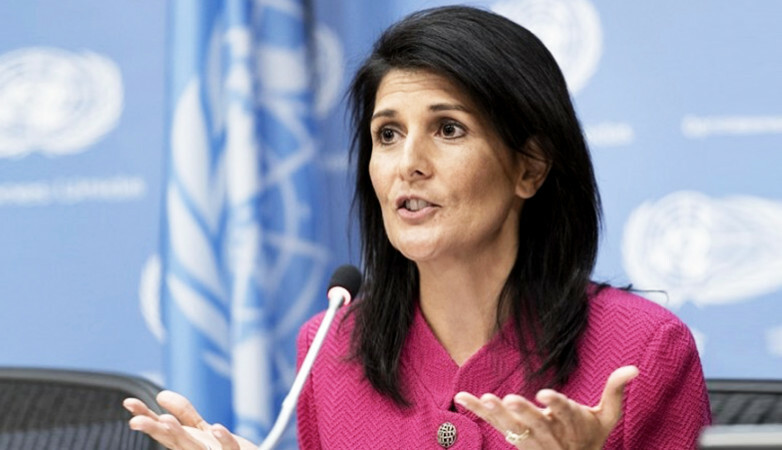 Although she lost the General Assembly vote criticising Trump's decision to recognise Jerusalem as Israel's capital, she managed to get strict sanctions against North Korea for its nuclear programme and to trim the UN budget.